What are your favorite Civil War recipes? 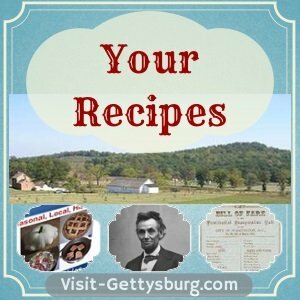 You can exchange Civil War food recipes with others right here with this page serving as an online recipe box. Click to jump down and see what other people are making. Try making a recipe and let us know how it tastes! I don’t promise that all of the dishes will be delicious. Hardtack certainly was not. But these are some realistic, authentic suggestions if you are planning a reenactment or a Civil War themed wedding. Do some reading to gain more ideas about food in the Civil War and what was available. If you want to share a dish below, please list the ingredients, instructions about how to put them together, and a little story about a time when you made it. Have a Civil War Recipe to Share? Do you have a favorite Civil War food recipe? Please share it!